If you seriously love pizza and want to enjoy the experience of cooking it your own backyard, you need the right equipment. Thankfully you do NOT need to spend hours and hours building an outdoor brick oven to get some fabulous pizzas these days; there are many excellent options that are more budget friendly, take up less space, are really easy to use, and that make some seriously good pizza. Here are some of the best outdoor pizza oven reviews for 2019. 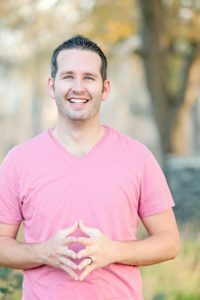 Before we jump in though, let’s take a very quick look at what you need to consider when making your choice – after you’ll see my top picks for the year. I’m sure by the time you’re done reading you’ll see a pizza oven that you love. What kinds of foods can it cook? How hot and fast do you want it to get? 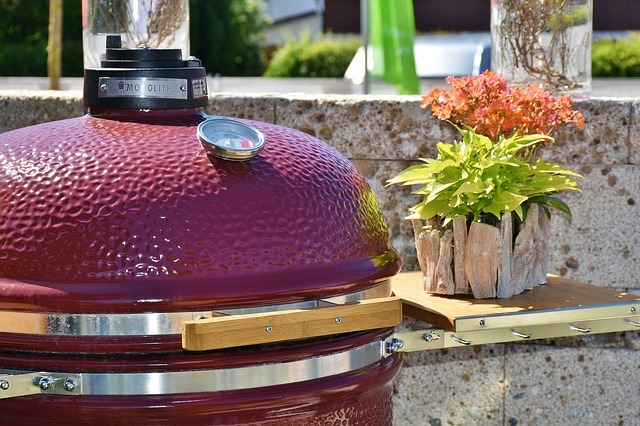 Portability vs Permanence: If you have lots of space on your patio for a big, solid pizza oven or want to add one to your outdoor kitchen, any of the ones featured here will be fine for you. 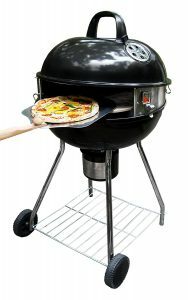 If you are tighter on space though or don’t particularly want the pizza oven permanently set up, there are several options that are either accessories that transform your current grill into a great pizza oven, or are simply smaller pizza ovens that will do well on balconies, can be taken along camping or tailgating, or can be put away into storage easily between uses. What Kinds Of Foods Can It Cook? Many outdoor pizza oven reviews share that you can cook more than just pizza on the particular model – but not all. Some pizza ovens are actually ONLY meant to cook up pizza. If you want something more versatile, make sure you ensure that the pizza stone can be used for more than just pizza. 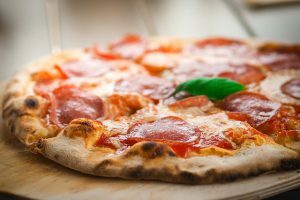 If pizza is all you want from it, there are some fantastic options that really specialize in turning some great pizza dough and toppings into a masterpiece. Heat & Speed: Pizzas cook best under extremely high and constant heat. Several of the grills below can reach temperatures of 900F+, which has your pizza cooking in under 2 minutes! This is great when you’re doing up pizzas for a crowd, but not everyone will need this. A grill that reaches 600-750F will cook your pizza just as well in around 6 minutes – and may come at a lesser price tag. Something to consider. Let’s do a very quick overview so you can jump to the outdoor pizza oven reviews that appeal most to you. Or, scroll down to see my recommendations in order of rating. If you’re simply looking for the best option for a stand-alone backyard pizza oven at a great price, THIS is the one to pay attention to. The PizzaQue is made of steel and comes with a 14″ round cordierite pizza stone and the propane regulator. You’ll love how quickly it preheats (up past 700F + in just 15 minutes! ), and that in just 6 minutes of cooking time you’re ready to eat a crisp, delicious pizza that reminds you of something baked in a high end wood burning pizza oven (without the smoke flavor, of course… and at a fraction of the cost). It’s lightweight, doesn’t take up a ton of room, and is nicely portable… meaning it’s perfect for the backyard AND great to take along camping or tailgating. You can use it on any surface (yes, even a plastic table top). A fantastic design: The PizzaQue has a vented lid that allows moisture to escape (toasty toppings), has a built in thermometer, is dome shaped with an inner shield that gets your toppings to cook at the same rate as your crust, and comes with a high quality grilling stone that distributes heat for evenly cooked crust. 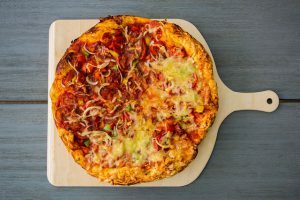 Although it’s meant for pizza (not steaks, veggies, etc), you can make all sorts of different crusts with it – you’ll just need to perfect your techniques for each. The PizzaQue is currently Amazon’s highest rated model and is “Amazon’s Choice” for portable pizza ovens (Amazon’s Choice means it’s a solid product, available immediately, at an excellent value). It’s not the cheapest pizza oven on this list, but for what you get, it’s a great deal. If you’re someone who plans to make a LOT of pizza, someone who cooks for a crowd, this is a great option for you. It’s a slightly larger yet still portable model, and it can cook (2) 10 -12″ pizzas at the same time! This outdoor pizza oven by Camp Chef is another well made and highly rated product that most people who have it really like. It lets you turn Italian artisan-style pizzas, reminiscent of a brick oven (but with way less work or expense), pizzas with a crisp crust and perfectly cooked toppings. It has a ventilated oven door with handle, and a built-in valve-ignition/micro-adjust value that lets you have full control over the flames and fine tune your pizza making skills. You can use this pizza oven for more than just pizza… it works well for baking breads, roasting meats, and more! 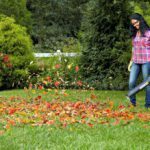 It’s designed to run both on a one-pound disposable propane bottle (for tailgating or camping), but also on a standard propane tank in your backyard – it comes with a regulator and five foot hose. It’s really easy to clean out if for some reason some pizza toppings end up slipping off your pie. The Camp Chef is a pizza oven that’s a little on the pricier side. Nothing too crazy but a little more expensive than most of the products on this list. But it’s worth every penny of its cost and I’m sure you’ll come to the same conclusion if you decide on this product. The ilFornino Professional Series isn’t like the previous two outdoor pizza ovens… it’s a pretty serious (and yes, fairly pricey) wood burning pizza oven that you’d would absolutely love in your backyard if you’re serious about pizza making. It’s can get up to full heat, 1000F +, in 22 minutes, and then cook your pizza in approx. 70 seconds. It has a large cooking area (1007 sq. inches) so you can cook for a crowd – at least 3 large pizzas or 6 small ones at once! You can use it for so much more than pizzas! Bake breads, bagels, cake, roast even grill steaks, chops etc. The oven part sits on a base, but you can also place it on an outdoor kitchen counter top as it’s not bolted on. You’ll notice how crazy heavy duty this oven is when you try to move it though – it’s no lightweight! It’s made with high-density insulation that keeps it 5 times more insulated than a traditional pizza oven – it has incredible heat retention, meaning you won’t find yourself needing to refuel every few minutes! It ships already assembled (other than the chimney) from where it’s made in Valley Cottage, New York – all you need to do is lift the (really heavy) oven onto the cart and roll it out to your backyard! It also comes with a Professional Peel, a brush, and a handy manual. The Professional series model is an upgrade from the ilFornino basic pizza oven, (which is good in it’s own right). There are 3 major upgrades: 1. The floor is now one flat slab/cooking surface (the Basic was made from several bricks… not as smooth for food delivery as the 1 1/2″ thick refractory pizza stone used in the Professional). 2. The whole unit of the Professional is built from a thicker stainless steel (the dome a single-weld). 3. The Professional has double the insulation of the Basic, so it retains the heat at a much better rate. Because the IlFornino Professional Series pizza oven is such a high quality item, it’s going to cost a fair bit more than many of the items on this list. Is it for everyone? No. Neither is the price tag. But if you’re looking for a tradional Napolitano oven with a modern look, a fabulous pizza oven that will last you years and years, it’s a great choice. Unlike the one above, which was a full out pizza oven on wheels, this next one we’re looking at is basically an accessory, something that you use along with your current favorite gas grill. 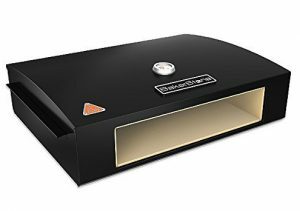 It’s a portable pizza oven box that you place on the grates of your grill – you use the grill burners to heat it up, and then insert your pizza for cooking. It’s a cheaper, more compact alternative. How it works: The patent pending design of the oven box raises the temperature of your grill to similar to a real wood burning oven (600 ᵒF to 800 ᵒF), and bakes your pizza using a combination of convective, conductive, and radiant heat. After pre-heating your oven box (about 20 minutes on high), your pizza get cooked in just 2-4 minutes! This is really handy for a pizza party where you’re making pizza for a crowd. You do need a 3 burner gas grill minimum for it to fit properly. There are pizza stones on the bottom, top, sides and back for even cooking. The design is great… other than the fact perhaps that it’s not the easiest to clean out other than pushing the “mess” (excess cornmeal, dropped toppings) out of the back and cooking it off. You can use it for cooking foods besides pizza if you desire; roasting meats, vegetables, and fish… or baking breads or even cookies apparently! Reviewers mention that BakerStone’s customer service is top notch with prompt responses and generosity when it comes to providing replacement parts. Here’s another outdoor pizza oven accessory that works similarly to the one we just saw – it goes right on the grill that you already have, converting it to a fantastic outdoor pizza oven. This kit by PizzaQue works only with Kettle Grills (or those of similar make like the Home Depot Master Forge) – but in particular, only 18″ and/or 22.5″ models. It transforms the heat from your charcoal grill to the same high temperature and smoky flavor of a professional, wood-fired pizza oven (around 900 F). Reviewers say a combination of charcoal and wood gets the highest heat & best flavor. 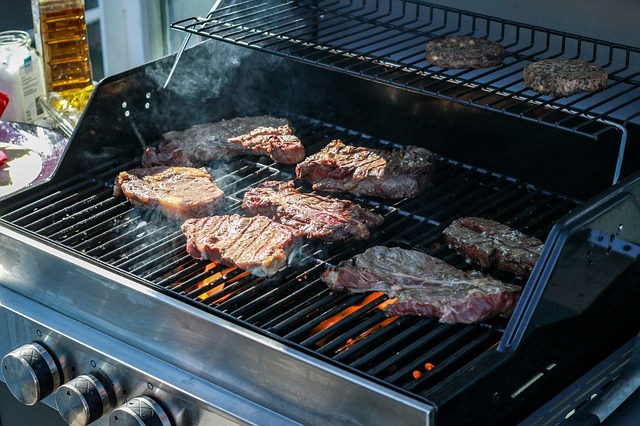 It’s very easy to assemble & install on your grill, and to remove it when you’re done; you won’t find yourself losing the use of your grill to it. 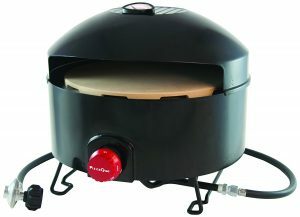 The PizzaQue Deluxe Kettle Grill Pizza Kit is a great option if you already have a suitable grill. It can give you the experience of pizza tasting like it’s from a traditional wood-burning oven — but without breaking the bank. However, if you don’t own a Kettle grill (or similar), don’t worry, there are other options that work just as well! 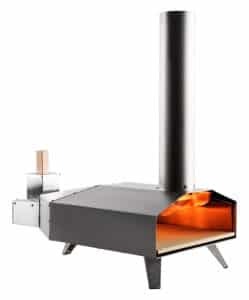 Here’s a rather unique option – a pizza oven that’s fueled by wood pellets! 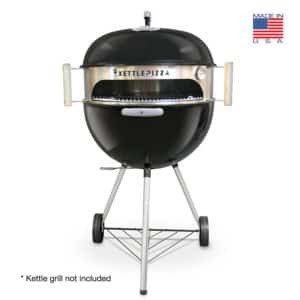 (See “What Is Pellet Grilling?” or “Best Pellet Grills” for more info on this type of outdoor cooking that is quickly gaining in popularity. This Uuni 3 wood-fired oven is pretty impressive… it can heat up to a whopping 932F + in just 10 minutes, and can cook your pizza in just 60 seconds! While using it does have a learning curve that other pizza ovens don’t have, it makes some incredible, wood-fired pizzas once you get the hang of it! It comes with everything you need (other than the pellets): the wood-fired oven, wood pellet burner, cordierite stone baking sheet, stainless steel pizza peel, and instruction manual/safety instructions. 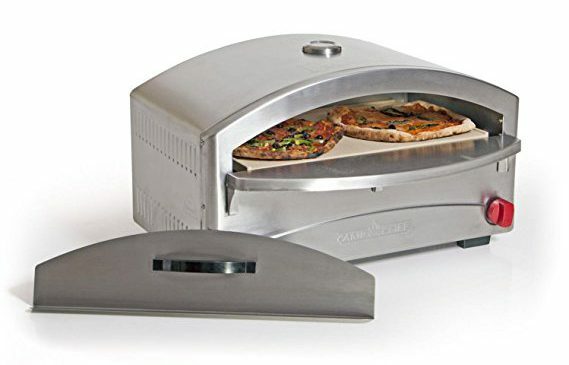 Although it’s designed for pizza (max size 13″), you can also use it for all sorts of other foods including meats, seafood, vegetables, and flatbreads – it’s ideal for any food that has a short cook time. The Uuni 3 heat is powerful enough to even cook properly in cooler weather, so you can use your pizza oven all year! This oven makes fantastic thin crust pizzas, as it cooks super hot and fast… but it can do a more traditional pizza with thicker crust and more toppings (you’ll have to let it heat up completely then cool off somewhat to 700 or so when the pellets are not flaming much. Again, some practice makes perfect)! The Uuni 3 wood pellet pizza oven is definitely not for everyone. It’s not automatic, and it’s cooking with live fire which needs some babysitting. But if you’re someone who likes to perfect things and tinker to create an absolute masterpiece, the Uuni 3 might quickly become your favourite backyard cooking tool! This is another slightly unique option on our list of best pizza oven grills – it’s a 3 in 1, meaning it will do a whole lot more for you than just make pizza… it’s a stainless steel grill that comes with heavy duty non-stick grill grates, a cast-iron griddle, and a thick pizza stone! It may not create absolute pizza perfection compared to some of the options we’ve looked at that are solely dedicated to the perfect pizza pie, but it will still do the trick – and do it well, according to reviewers! The SS burner runs at 12,000 BTU, and with the stone and ambient heat, that can get up the pizza oven to temperatures well above 500F… hot enough to cook your pizza in about 6 minutes! It’s nicely portable and compact, easy to hook up and use. 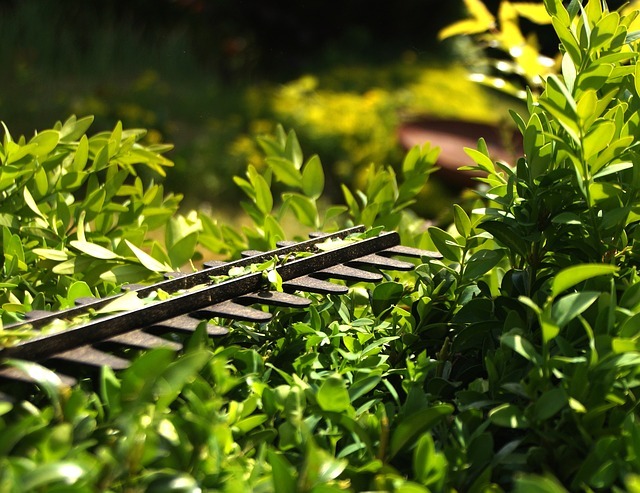 It’s perfect for taking it along camping, on the boat, or tailgating – but you’ll also find it great for smaller balconies or patios. You can clean this in your dishwasher. Yes, that’s right. The whole base including the grease tray slides out and can be run through your dishwasher. Win, win! The different surfaces give you so many options; there is really no limit! How does bacon and eggs for breakfast, pizza for lunch, and steak and potatoes for dinner sound… all done on this handy little 3-in-1 grill? If you are after Neapolitan style pizzas, I’d suggest a standalone pizza oven instead of the Mont Alpi 3-in-1. 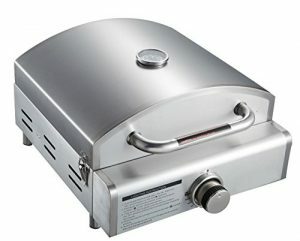 However, if you want a more all purpose portable grill that has enough BTU to also do a decent job at pizza, then this grill is a good compromise especially if you can get it on a good sale. The Blackstone Outdoor Pizza Oven is one that most people will love and that is definitely worth a closer look. It is even currently “Amazon’s Choice” for outdoor pizza oven – meaning it’s recognized as a great product, is easily available, and can be had for a very decent price. The grill offers 60,000 BTUs for a very quick and even heat (convection style) – meaning you’ll have a perfectly cooked pizza, toppings and crust – in approx. 2 minutes. You can cook more than just pizza on it – if you treat it as a backyard oven, you can cook up anything from brick oven-style pizzas, to pastas, steaks, breads, roasted vegetables, desserts and much, much more! 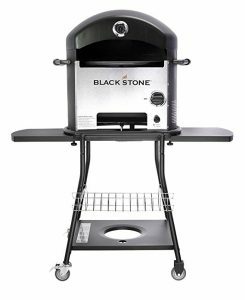 The Blackstone is set up on swivel casters, letting you move it wherever you want it (you’ll love this on windy days, when you might find you have better results with your grill in a protected area). 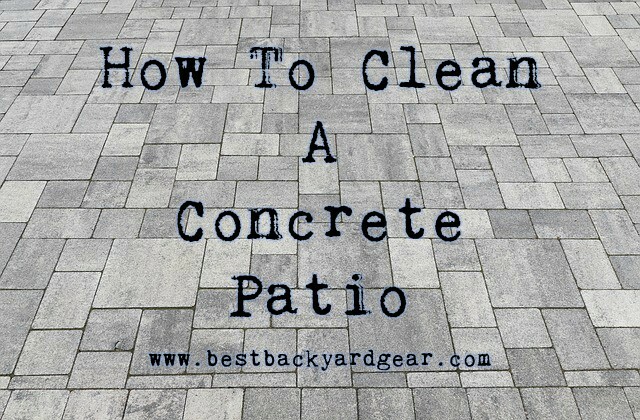 You can also remove the legs and set it on a countertop in your backyard kitchen to use it more permanently! Blackstone has impressive customer service – looking through the customer reviews you’ll notice many examples of people who had quick and generous help from the company when required (there are several instances of damaged parts on arrival, but Blackstone sent replacements immediately). This outdoor pizza oven is not your cheapest option, but it’s definitely going to allow you to make seriously impressive pizzas with minimal effort. Is it worth the price? It’s a very popular option, so take a look through the customer comments on Amazon (the link below) and see for yourself. Here’s another option that is a pizza oven kit, or accessory for your backyard grill. It’s specially sized to fit on kettle grills (or brands of similar shape) that are 18.5 or 22.5″ – and it transforms them with very little effort into a serious pizza oven! If you have a kettle grill already, you can save yourself a few bucks (and extra storage space) by going this route! The kit includes the stainless steel sleeve (20 gauge, 304 grade), handles, thermometer and aluminum pan – the deluxe version includes the pizza stone and peel. If you have your own stone already, this can be a cost savings here! It has room to make a fairly big pizza (14″) – the mouth opening is 17″ end to end. The unique sleeve design creates a cooking chamber that has stable and consistent high heat (900F+), regardless of how often you check or turn your pizza (great pizza with the crust and toppings cooked evenly requires constant high heat – opening and closing doors creates fluctuation). You can truly enjoy a traditional wood-fired pizza, smokey flavor and all with this grill. Pizzas can be made back to back to back (2-3 minutes each) as the heat isn’t lost from the oven during changeovers. The KettlePizza just simply sits on top of your grill! It’s extremely easy to switch back to a standard grill… you just lift the sleeve off! I wouldn’t consider the KettlePizza cheap but you don’t want a cheap, flimsy piece of metal if it’s going to be working with temperatures near 1,000F. That’s just going to lead to issues and a miserable time. You want to make sure you’re getting quality and that’s exactly what you’ll get here. Worth a closer look. Ready for some great backyard pizza making? There’s something for everyone in these outdoor pizza oven reviews! We’ve got the big models for super serious pizza chefs, the quick “on the go” portable units, the 3-in-1 grills that will make pizza AND lots of other great food, and even some great pizza oven kit accessories that transform your current grill into something special for pizza making! Which one do YOU gravitate towards? Want to learn more about grilling pizza? 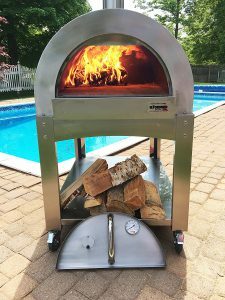 Check out this awesome resource on wood fire pizza ovens and how to use them best! As always if you have any questions or feedback, let me know in the comments below and I’ll get back to you shortly! Until then, enjoy your pizza! Top 5 Round Picnic Tables That Fold And Store Easily!